For years, marketers have debated the benefits of social media versus email marketing. However, in today’s multichannel and omnichannel environment, the reality is that brands must use both to engage and retain their audiences. According to the Marketing Rule of 7, consumers need to “hear” a message at least 7 times before taking the desired action. Combining email marketing with social media efforts allow brands to target their audience more frequently, ultimately moving them through the customer journey. 80% of marketers report that increasing brand awareness is their number one goal for using social media. 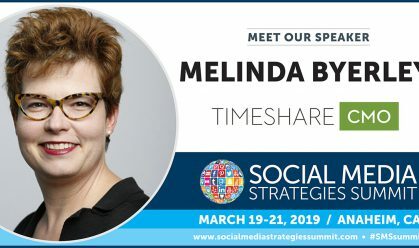 By sharing great content, maintaining consistency, and listening to their audiences, brands can capture the attention of their share of the roughly 264 million people using social media in the US. Email marketing, on the other hand, is more successful at driving both consideration and conversions. Need proof? Social and email clearly have their individual strengths – which can be made all the more powerful by uniting the two for a more holistic approach to your marketing efforts. Read on for 6 ways to integrate social media and email marketing. 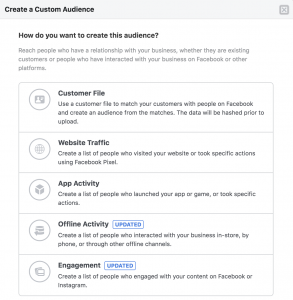 When you create a Facebook ad, you can choose between identifying an audience via Facebook’s targeting tools or you can use what is referred to as “custom audiences”. Custom Audiences allow you to reach customers you already know with ads on Facebook. When you upload a customer file, Facebook will identify those people (if they are on Facebook) and serve them ads. This feature is a great way to engage with email subscribers on another channel. Encourage subscribers to consider your brand further by reminding them of the campaign messaging. You can target anyone on your email list, or choose to serve an ad to just those subscribers that have opened a recent campaign. For detailed instructions on setting up your customer file custom audience, head over to Facebook help. A Lookalike Audience is a highly effective way to identify and reach new prospects. These people are typically more qualified than a general audience because of the information that Facebook gathers on each of its visitors. 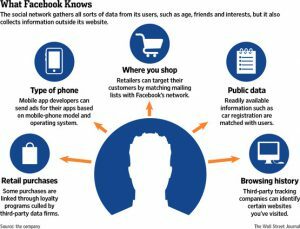 (See the Sprout Social graphic to the right for more on what Facebook knows about us). Once your customer file audience is created, you can create a ‘lookalike audience’ from the file. This audience will be filled with people who are likely to have an interest in your business because they have similar characteristics to your email subscribers. Lookalike audiences are not only a great way to reach new people, but also tend to be less expensive than audiences based on interest or behavior targeting. It’s important to note that your customer file audience must have at least 100 people from a single country in order to use it as the source of the lookalike audience. Here are Instructions on setting up a lookalike audience. BONUS TIP: Serve this lookalike audience a brand awareness campaign that drives them to a landing page that provides a piece of high-value content in exchange for their email address. Create an email list of these prospects and send them a welcome campaign that repeats your message. Use Social Media to engage your customers. 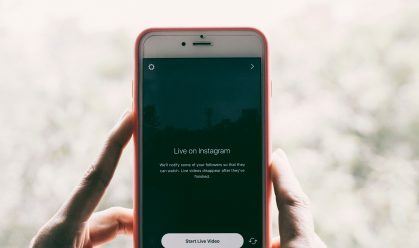 Cultivating a large social media following is an important goal for many brands, but it shouldn’t be the channel you rely on to spread your messages. After all, you don’t own your social media followers – and they could be gone tomorrow. One of the best ways to create value for your brand from social media is to convert your following into email subscribers. Create regular social posts that remind followers to sign up for your email list. Share a preview of the type of content shared in email campaigns, or offer an incentive for new subscribers. For example, hold a sale and let followers know they need to subscribe to learn the details of the promotion. Include an easy, frictionless link to your email sign-up. Host a big giveaway. It isn’t always easy to get fans to leave Instagram or Facebook to sign up for a newsletter. Create an offer that they can’t refuse. Build a gift basket, free course or another high-value gift to promote on social media channels. Create a landing page on your website with the details of the promotion and an email opt-in form. Promote this giveaway regularly on your social channels over 4-6 weeks and really build up the buzz around this contest. BONUS TIP: Partner with another brand or company and cross-promote the giveaway on both of your platforms. That way, you each get the benefit of the other brand’s followers. Just make sure the partner has a similar customer base. Create value with gated content or discounts. Remember that an email address is valuable to your business, so offer something of value in return. This is often a discount for e-commerce (10, 15 or even 20% off their first purchase) and gated content for B2B. The primary focus of social posts offering gated content or discounts in exchange for an email is adding value. BONUS TIP: Incentivize sharing. Create an additional discount or special offer for current email subscribers who share your post or newsletter on social. Ask subscribers to copy or tag you on their share so you can be sure to send them the extra treat. Share images from your fans. 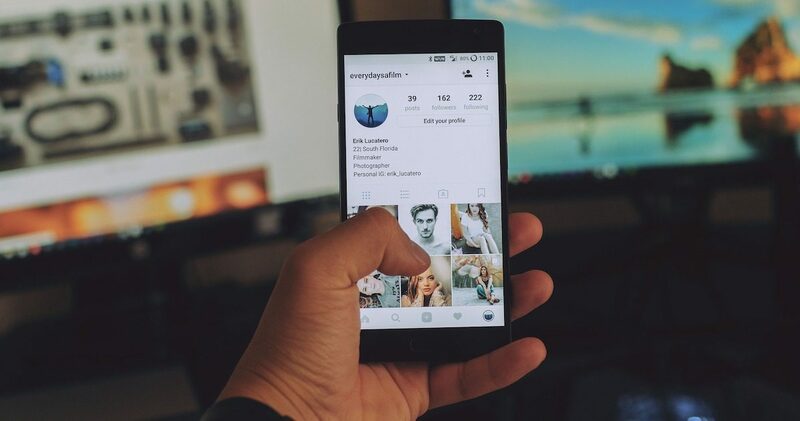 User Generated Content (UGC) was one of the biggest marketing trends of 2018, and it isn’t going away any time soon. 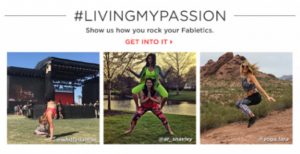 More than 86% of businesses are utilizing UGC as part of their marketing strategy. Consumers like the authenticity of UGC over standard brand posts. On average, UGC posts see a 28% higher engagement rate than any brand-created content. In email campaigns, UGC is effective at serving subscribers with relevant, useful information about how products are used in real life. It also creates social proof, nudging engaged subscribers further along the customer journey. Incorporate UGC into your email campaigns by sharing images from your fans at the footer of every email. When possible, use images that relate to the products or services you are promoting in your campaign. 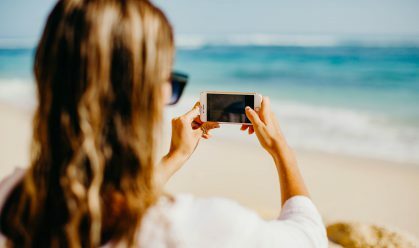 UGC can also become the primary focus of the campaign by including customer reviews and images and encouraging email subscribers to upload their own content. BONUS TIP: Create a branded hashtag to engage your customers, tell them how to share their content, and make it easy for you to find. The #treatyourselfie campaign from Skull Candy is a great example of an entire email campaign aimed at encouraging subscribers to engage with the brand on social media. 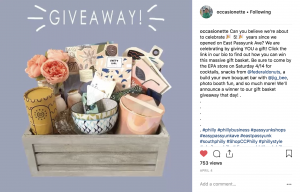 Skull Candy uses their branded hashtag, #treatyourselfie to encourage subscribers to create and share user-generated content, tag Skull Candy and have the opportunity to win. 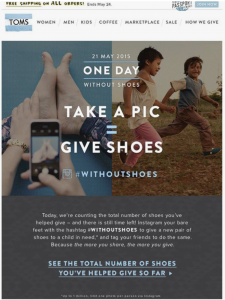 For Toms, the campaign above is all about raising awareness for their charitable goals. While subscribers don’t get a discount or a prize, they do get to support a good cause. Much like encouraging your social followers to become email subscribers, it is important to create value for the subscriber in exchange for engaging with your brand on social media. Email subscribers are 3x more likely to share content on social media than customers or fans acquired from other channels. Encourage subscribers to like, follow and share by consistently reminding them how and where they can follow your brand on social media. Your email template should prominently display both social share and follow icons. However, the most effective way to promote social media within an email is to create campaigns specifically with this goal. Both H&M and Handy are good examples of how brands can entice subscribers to engage on social media. They create value for their readers by showing them what they can expect to see on social media, and how it differs from their experience as an email subscriber. Both social media and email marketing are key components of a well-rounded, holistic marketing strategy. While there are benefits to each, the real results are found when they are integrated to create a seamless customer experience. Make sure you are getting the most out of both channels by taking steps to ensure your email marketing and social media are working together. 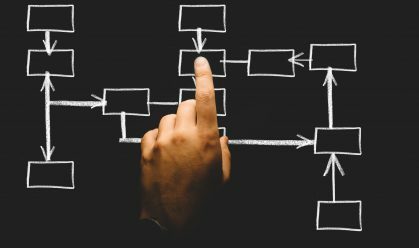 We hope these tactics will help you to create more of a connection between these two channels. Have you found any other tactics successful in integrating social media and email? 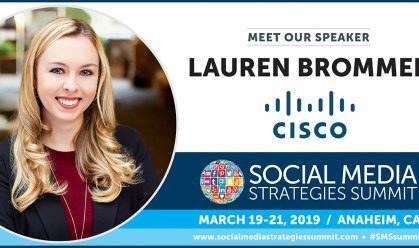 Learn best practices on how your brand can take a holistic approach to social media strategy and other marketing channels at an upcoming Social Media Strategies Summit.